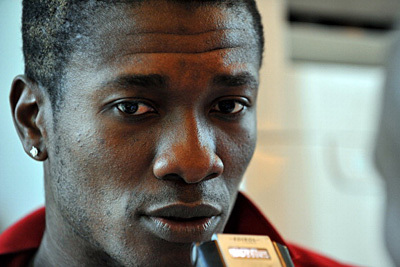 Ghana captain Asamoah Gyan says his sole focus is simply to see his side advance past the group stages of the Africa Cup of Nations. After that, he will then start entertaining thoughts of bringing the cup home to Ghana. Ghana's preparations for the tournament included a 3-0 win over Egypt and a 4-2 win over Tunisia to put them in a good position ahead of their opening match with Congo. The Group B match takes place in Port Elizabeth at the Nelson Mandela Bay Stadium on Sunday. "The players know that, the people back home know that we are here to play for our country. We know that the other teams are here to play hard for their country," he said. "As I said earlier we need to get through the group stages before we start thinking about think about winning the cup." Ghana are aiming to end a 31-year trophy drought, and go into the clash against Congo having won eight of the 14 clashes between the countries. The two last met in a 2006 World Cup qualifier where both games ended in draws.